Semantic web why it will be more and more important for ecommerce website development? | TransPacific Software Pvt. Ltd.
Home » Blogs » TPS2015's blog » Semantic web why it will be more and more important for ecommerce website development? Semantic web why it will be more and more important for ecommerce website development? Let me give you an illustration. 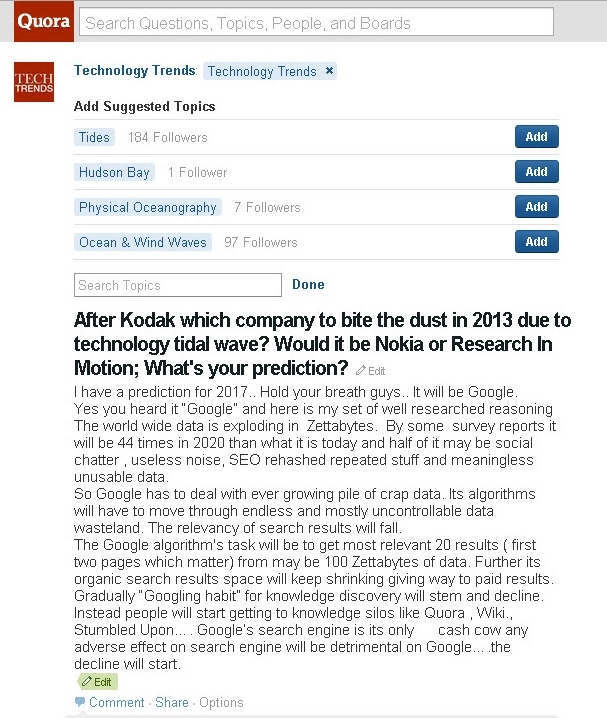 Recently I posted a technology related questions on quora.com under “Technology trend” topic (refer to the screenshot). The question is “After Kodak which company to bite the dust in 2013 due to technology tidal wave? Along with the question Quora provided a slew of related topics: Tides, Hudson Bay, Physical Oceanography and wind waves”. Totally irrelevant. This simple case illustrates one of the biggest drawbacks of “search engines”; It simply cannot understand the context and reference in human language. Search engines search “in a dumb“ way; by comparing text strings with text strings. Whatever advances are made by Google or Bing they still remain dumb. In the above example “Quora” has picked up a seemingly most important word “tidal wave“ and served us the suggested topics which are unrelated to question. “Can RIM pull rabbit out of its hat to save itself” the search string on Google provided me much more relevant results but ad-links to “Rabbit farming” and “save our environment ". Neither my question is wrong nor is search engine is wrong. The problem lies with search methodology. Semantic Web look at the meaning of the data. Semantic Web meta tagging will put meta data in the web page which will help search algorithms in distinguishing from a “computer chip” to “potato chip” Eventually, your computer will know that this document you're reading is a "blog", it's author is "Prashant Telang", it's publisher is “ TransPacific Software", and it's topic is" semantics in ecommerce. The term Semantic web was coined by Tim Berners-Lee, the inventor of the World Wide Web and director of the World Wide Web Consortium ("W3C"), which oversees the development of proposed Semantic Web standards. He defines the Semantic Web as "a web of data that can be processed directly and indirectly by machines."….. So how can semantic web be put to use in ecommerce sites? Organizations like Good Relations are developing powerful ecommerce vocabularies for publishing all of the details of your products and services in a way friendly to search engines, mobile applications, and browser extensions. By adding a bit of extra code to your ecommerce Web content, you make sure that potential customers realize all the features and services and the benefits , because their computers can extract and present this information with ease. Search engines like Google & Bing have already adopted semantic web through knowledge discovery products like Google Knowledge Graph and inducted it in Google webmaster central under “structured Data Dashboard”. Further Google Recommends Using GoodRelations Vocabulary for ecommerce products descriptions. Few shopping cart frameworks like Magento, OpenCart & WordPress-ecommerce have come up with semantic meta data plugins. Here is a WordPress Plugin screenshot with semantic web meta data input per product. However providing semantic meta data with each product “manually is cumbersome. TransPacific Software is working with its ecommerce clients to have automated systems developed, to have backend semantic meta data automatically inserted with products. We expect enormous benefit to ecommerce sites in SEO and search engine Ranking.